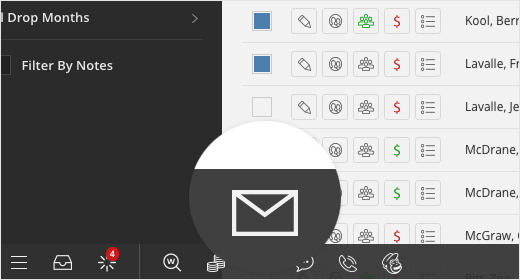 The email blast feature allows you to compose and send an email using images and variables to communicate with several customers at once! After clicking send, the task will be sent to the Background Task to complete. When the emails are finished sending, a report will be available in your background tasks with a copy of the email you sent and a detailed list of emails it was sent to. It will also tell you which email addresses may have opted out of your email blasts and which emails were not valid. Want to send more than a quick message? For professional templates, open and click analytics and more - check out our MailChimp integration! From the family, student, classes, camps or staff pages, open the email blast window by first selecting who you want to email from the list, then clicking the email button as shown below. - When sending email blasts from the CLASSES page, iClassPro always sends to active enrollments on the current date. It does not use session or rolling dates to determine which customers to email. To send emails to past or future students, use the STUDENTS page with the active filter and an accurate date for the enrollments. See https://support.iclasspro.com/hc/en-us/articles/218569618-Emailing-Future-Enrollments for more information. - Enrollment type filters (ACTIVE, WAIT, MAKEUP, TRIAL) are available when sending email blasts from the STUDENTS page. The system will use the "On Date" specified in the filters to determine who is eligible. - Attendance status filters are also available on the STUDENTS page. These will reflect students who were PRESENT or ABSENT on a particular date (along with Tardy/Left Early options for PRESENT and Excused/Unexcused for ABSENT). Add your message (text) in the Email Body. Note: While sending, the email will turn into a background task at the bottom left of your screen. Emails sent through iClassPro will be delivered from our servers (not your inbox), using the email address (under Settings>Locations) for the toggled location as the "reply-to" address. The "from" address in the email will be noreply@ses.iclasspro.com, and your customers may choose to add that contact to their address book to ensure that they get emails and to prevent them from going to their spam folder. For more best practices and troubleshooting steps for email delivery, click here. We understand that sometimes you want to send out documents to a large group of customers. 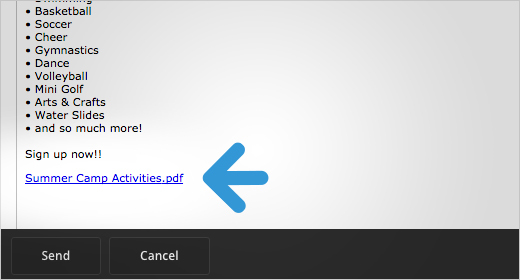 That's why you can now upload documents in iClassPro for use in email blasts! Customers can access these files by simply clicking on a link inserted in the email which directs them to the uploaded document. First, select your intended audience, then click the email icon. 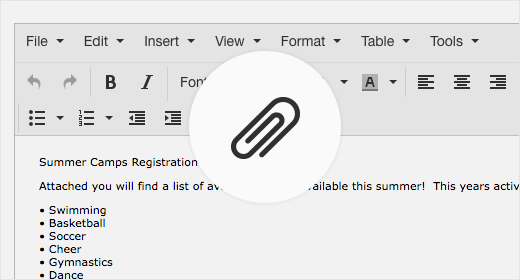 Next, select the Attachment icon within your email toolbar. Upload or Select your attachment from the most recently uploaded list provided. 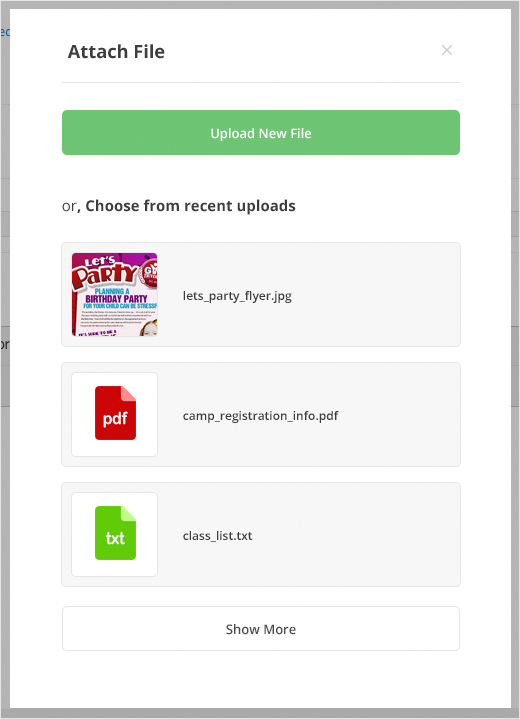 You can select from any of your previously uploaded files by clicking the Show More button. Your attachment will be created in the form of a clickable link. 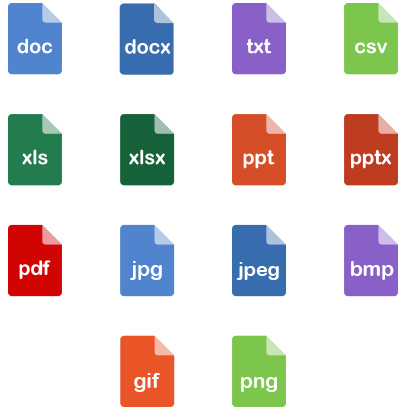 You can manage your files by clicking Settings, then Uploaded Files. 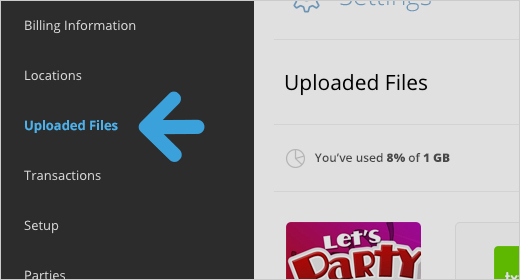 You are given 1GB of FREE Storage! When your email has finished sending, you will find a document labeled "Email Blast :: SUBJECT OF YOUR EMAIL" in your background tasks. This document will contain information about what was included in the email and who was contacted (as well as any unsubscribed or failed email addresses). Note: You may wish to download and save this document for your records. This document will remain in your background tasks until it is deleted or 60 days pass, at which point it will be automatically cleared.